At The Bespoke Album Company we believe your fondest memories deserve a special home and that our Traditional Photo Albums provide the perfect place. Our albums are not just places to file photos they are designed as conversation pieces bringing shared memories to life, again and again. Staggering quality of materials, workmanship and finish. The album oozes quality. I am utterly delighted with the outcome. In addition the price was very competitive indeed. Named after employees past and present our luxury leather wedding albums are individually created to keep your most treasured memories alive. Handmade to order in our bindery our wedding photo album is available in: white, ivory, black or red leather and includes archival card cream pages. To add to that special one-off feel we can also personalise your album by adding names and the date of your big day in either silver or gold foil lettering. Alternatively, for a more contemporary look we offer clear debossed personalisation. And if you would like somewhere safe to store your album we also have a lovely matching leather clamshell presentation box. So why not indulge yourself and commission a fabulous family heirloom to treasure for years to come. Celebrate your baby bliss with one of our beautiful baby photo albums. Available in classic white leather, with a silver and white double ribbon page marker and archival card cream pages, these albums are handmade to order in our bindery. All include a cute pair of clear debossed baby footprints giving a contemporary twist we think you’ll love. And for that truly bespoke feel we can personalise your album with baby’s name and birth date in silver foil lettering, providing the perfect contrast to the snow white leather. From christening and naming ceremonies to first steps and beyond, our baby photo albums are the ideal place to protect and cherish special moments. And if you would like somewhere safe to store your album we also offer a lovely matching leather clamshell presentation box. An anniversary album is a perfect gift to mark those special wedding anniversaries and provide your loved ones with a trip down memory lane in celebration of many years together. Handmade to order in our bindery our bespoke anniversary photo albums are available in classic white or cream leather and include archival card cream pages. For that extra special one-off feel we can also personalise the album with a double ribbon page marker and foil lettering colour to reflect the anniversary such as gold, silver or ruby red. And for the ultimate finishing touch we also offer a matching leather clamshell presentation box to safely store the album. 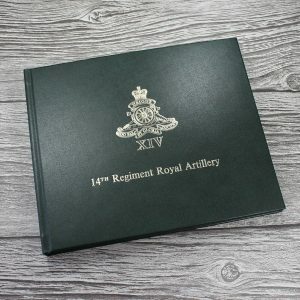 Why not let us help you create a unique keepsake that brings back the joy and laughter of years gone by. Our wedding guest books provide a beautiful place for you to capture memories messages and moments from your special day. Handmade to order in our bindery by highly skilled craftsmen and women our personalised guest books add the perfect finishing touch to your wedding plans. We want to make it easy for you to bring back the laughter love and joy by creating a luxurious keepsake that feels uniquely yours. That’s why we offer a wide range of colours and choice of materials including plain satin, satin taffeta and leather. We can also personalise your guest book by adding your names and the date of your big day in silver or gold lettering giving a truly one-off feel. So whether you want satin taffeta in marvellous magenta or classic ivory or white leather we’ll help you design a wedding guest book you’ll love. We make it easy for you to create a keepsake that is uniquely yours by offering a wide choice of colours, materials and sizes. Our highly skilled artisan binders pride themselves on creating one-off albums and guest books to the highest standards using traditional methods. 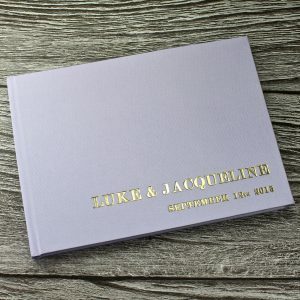 We can personalise most of our albums and guest books with names and dates and offer a range of foil colours for you to choose from. Witness a little piece of history by watching one of our artisan bookbinders personalising the cover of a luxury leather wedding album using the hot foil blocking process.